Every person has his or her idea of what makes the ideal retirement location. Many pre-retirees are drawn to places where the climate is mild and senior-friendly amenities are plenty, while some favor neighborhoods close to urban centers with top-notch healthcare and entertainment facilities as well as opportunities for employment. Still others are content to stay put in their current communities and enjoy the retirement lifestyle choices and benefits in store for them. For those who decide to retire in another state or even country, comfort, security, and the availability of healthcare and other essential services are paramount. Incidentally, Costa Rica scores high on all these aspects as well as those pertaining to cost of living, retirement infrastructure, ease of integration, and real estate. 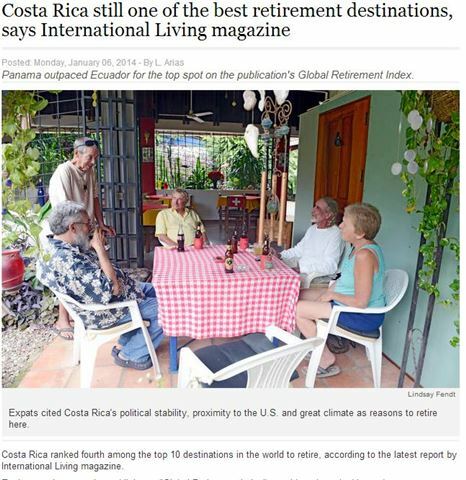 A recent Tico Times article sums up the findings of an International Living report as regards the top retirement destinations in the world. “This year’s ranking states that Costa Rica’s “legacy of year-round warm weather, as well as longtime political stability and public safety” earn the country a ranking in the top 10.
International Living also cites the affordable yet high standard of living in Costa Rica as a key factor why as many as 20,000 U.S. expatriates and retirees choose to take up residence in this Central American nation. It also helps that the country is blessed with an abundance of natural beauty, biodiversity, and pleasant temperatures throughout the year. Such factors make it quite clear why prime real estate for sale in Costa Rica, whether along the coast or further inland, has enjoyed stable demand from international buyers. Whether you’re looking for an investment property or somewhere you could comfortably retire, you’ll want to work with a trusted real estate firm—such as Dominical Real Estate—that knows the local property market quite well. When considering the best options in relation to real estate for sale in Costa Rica, it certainly pays to have a reliable expert by your side. Posted in News and tagged Costa Rica Real Estate, expats in costa rica, retire to costa rica.